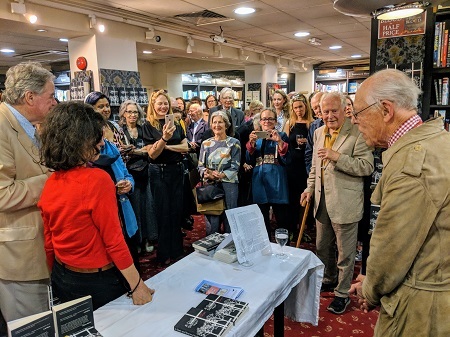 Sarah Ashpole of Waterstones Notting Hill introduced "up and coming" (born 1930) local author Tom Stacey - he lives a quarter of a mile away, in a splendid house on Kensington Church Street - at the launch of his new novel, A Dark and Stormy Night (Medina). The novel is about a recently bereaved former missionary and bishop recuperating in the south of France and meeting again an earlier love. Stacey (pictured on the right, making his speech) has been a foreign correspondent, travel writer, novelist, and publisher (Stacey International). Guests at the party included publisher Piers Russell-Cobb, agent Andrew Lownie, and authors Brenda Maddox, Daniel Johnson, Jonathan Aitken, Zachary Leader, and Elisa Segrave.